Dubai: The Ministry of Interior issued an alert on Sunday, warning motorists to drive carefully during unstable weather conditions. Scattered rainfall is expected to affect various parts of the UAE on Monday, especially over the northern and eastern emirates. The weather is also expected to further drop over the next two days, accompanied with moderate to strong northwesterly winds that will blow dust and sand over the exposed areas, with a speed of 25 - 35 km/h, which may reach up to 50 km/h at times. The Ministry of Interior advised residents not to sit or cross valleys and streams, and to keep children away from small lakes and ponds. “Heavy rain and flowing water may result in destruction and sloping of roads,” it said. On Sunday afternoon, heavy water overflowed wadis in Fujairah and Ras Al Khaimah. 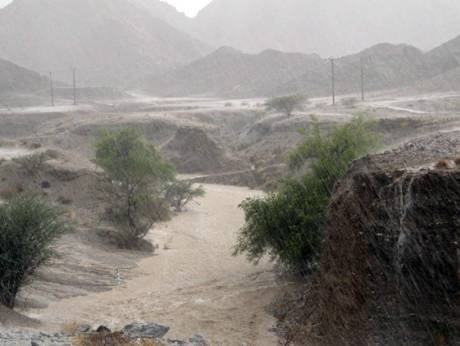 The National Centre of Meteorology (NCM) posted several videos of the valleys, icluding the wadi near Jebel Jais, which succumbed to the massive downpour earlier in the day. Ras Al Khaimah Police deployed 44 traffic patrols and rescue vehicles all across the emirate, especially near the mountain areas and valleys, to control traffic movement and provide assistance to motorsists. Brigadier General Dr Mohammad Saeed Al Humaidi, Director General of Central Operations at Ras Al Khaimah Police, said that all the teams have collaborated their efforts to provide safety and comfort to residents and motorists alike. He called on motorists to adhere to the safety rules as instructed by the Ministry of Interior, and in the event of an emergency, urged motorists to contact police on 999 or 901.